Hey, Dianne, If Your Secret Letter That Could Clip Kavanaugh Was Serious, Why Did You Wait So Long To Contact The FBI? Senate Democrats know they’re going to be defeated on the Supreme Court nomination of Judge Brett Kavanaugh. The GOP has the votes. They don’t. They can’t block him, partially the reason why the opposition to this nomination, while intense at times, has been lackluster overall. They have little tools to fight with against the Trump White House on judges, which has been pushing through nominees at all levels. From WP (which is kind of embarrassing for those Ds who rushed to get it to FBI): "the FBI does not now plan to launch a criminal investigation of the matter, which would normally be handled by local authorities, if it was within the statute of limitations." The Senate Judiciary Committee’s vote on his nomination is set for September 20. As Katie wrote yesterday, there’s been a zero hour attempt to derail Kavanaugh, who has proven to be mainstream, level-headed, and eminently qualified to be our next Supreme Court Justice, with some shoddy secret letter about an alleged incident of sexual misconduct that happened decades ago, though it’s so secret it cannot be shared with Republicans. Sen. Dianne Feinstein (D-CA) has the document, which she sent to the FBI. This isn’t new either; Feinstein knew about thissince July. If there was any hope of muddying this nominee with a possible criminal investigation, the Democrats came up short. The FBI isn’t pursuing one. Maybe it’s because this whole episode is total and utter bullcrap. I mean, it is, folks. The allegation is that Kavanaugh and a friend locked a girl in a room at a party when he was 17-years-old. UPDATE: The allegation is actually more serious, but, again, something is off here. Some Democrat was bound to have something. Mr. Kavanaugh had come through his confirmation hearing last week without a dent, and Democrats had made themselves look bad by editing his quotes and spreading innuendo unrelated to his judicial views. Meanwhile, the political left is demanding that Democrats do something, anything, to stop the highly qualified jurist from joining the High Court. 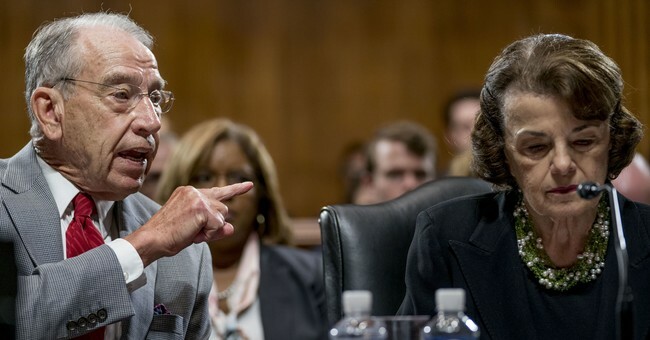 Ms. Feinstein offered no details, and Judiciary Chairman Chuck Grassley said Thursday that she didn’t share the information with him. News reports say the information refers to a letter from a woman concerning possible sexual misconduct when she and Mr. Kavanaugh were both in high school. That would have been sometime in the early 1980s. News reports also say that Ms. Feinstein has had the letter since the summer,and that it was first sent to the office of Rep. Anna Eshoo, a Democrat from Silicon Valley. But if the “information” is worrying enough to send to the FBI, why did Sen. Feinstein wait so long? She didn’t bring it up during the summer in the run-up to the hearings, didn’t mention it when she met with Judge Kavanaugh, and didn’t think it was important enough to tell her colleagues. The charitable explanation is that she didn’t think the information was credible enough to warrant investigation, but that now under pressure from her colleagues she felt obliged to surface it. So here’s what we have: A story floated at the last minute about an accusation whose details are unknown from a woman whose identity is secret. The episode says more about the desperation of Democrats than it does about Mr. Kavanaugh, and the real disgrace would be if Republicans did anything other than move promptly to a confirmation vote. Columnist Kimberley Strassel commented on social media that this point, the secret letter from a secret person who alleges sexual misconduct, which was kept from the GOP, but wasn’t serious enough to bring to the FBI until now, is “scary.” It sounds very…deep state, huh? --This is impt enough to be sent to FBI, but not impt enough to have been raised before now? Can't be both. NYT reports she got the letter this summer. --similarly, this is impt enough to be sent to FBI, but never shared with a single Republican charged with advice and consent? --Feinstein statement explicitly acknowledges that the accuser did not want to take this further. So why is it with the FBI? --timing here cannot be ignored. Coming only after Democrats were unable to further stall a vote. --and just to be clear, Ds and media are now using a secret letter with a secret accusation from a secret person, to try to take down Kavanaugh. Scary. Nominees are usually given a week to answer the written questions, which are supposed to be clarifications and follow-ups to the questions the judge answered in person during last week’s confirmation hearing. 5) Let’s say it’s true. If someone is a predator, they likely don’t try something once, then never again. Are there any additional, credible, *specific* claims about BK along these lines? With an accuser who will go on the record with evidence? 6) & isn’t it very possible the intent of “forcing himself on her” (broad term) was perceived quite differently by each party in the moment? It may not have been actionable at the time, even if she’d instantly called the cops. How the hell are we supposed to adjucate that NOW? 10) And points in Kavanaugh’s favor as his camp tries to push back vs. this decades-old vapor (letter signed by 65 women, BK’s record of empowering women & being a good dad etc) are being wielded AGAINST him as ‘proof’ of his own desperation or compensation/contrition. It’s nuts. 12) Unless clear, add’l evidence emerges, this is awful, unfair & obviously designed to cast a shadow over the legitimacy/character of a nominee they can’t beat or stop on the merits. And we wring our hands about good ppl not wanting to subject themselves to public service! Gee. And who says we're not at a state of war with the Democrats? Because with this, and a slew of other antics, we are.